The People's Ferry - linking Cork and Swansea with a comfortable overnight crossing! The Peoples’ Ferry is the nickname that has become attached to the new freight & passenger ferry service operating between Ringaskiddy (Co. Cork, Ireland) and Swansea (Wales). This new service, (run by Fastnet Line Ltd. using the cruiseferry MV Julia (a.k.a. ‘da Julia’) is wholly owned by a co-operative of small investors from West Cork, County Kerry, Ireland, South Wales, the UK and around the world. This website tells the long and heartwarming story behind the Peoples’s Ferry, the grass-roots campaign which ran from April 2008 to February 2010, and provides up-to-date news about the Co-op, and Fastnet Line. The four-year interruption of the service (2006 - 2010) made life difficult for business and tourist travellers on both sides of the Irish Sea - but the new route is resoundingly popular with many people who are attracted by the leisurely overnight sailings and the prospect of saving nearly 400 miles of unnecessary driving on each round trip. Special thanks are due to Noreen O’Donovan (from Limerick) for her amazingly epic limerick all about the Julia.... read it here! Not sure what this is all about - but they look to be having a great time! and to Mark in Schull for his usual video magic. Fastnet Line the company which runs the Cork to Swansea ferry route celebrates the first anniversary of operations on Thursday 10th March. The first sailing on the route since 2006 took place on this date in 2010 when the Julia set sail from Swansea to Cork. 23/11/10 Why Invest in the Ferry Co-op? Anyone who has done it, knows that it takes 3 years to found a business, another 2 years to consolidate the foundations, and from there you have to go on refreshing it every year and building in 3-5 year cycles depending on the industry you are in. The leading manufacturing companies in the world think and plan in 20 year cycles; the leading service companies have to gallop fast just to keep pace with the rate of change and the competition. Many good businesses have been started not with an original idea but with a copy of an old, proven idea to which they add appealing variations. That’s essentially what has happened with the new ferry that serves the route between Swansea and Cork; a route on which the previous ferry carried 2,850,000 passengers over 20 years but which went out of service for technical reasons in 2006. The Fastnet Line brought the MV Julia in to serve the route in 2010 with the concept of passengers’ holidays starting when they step on board the ship. This means more and better cabins where you are welcomed with wine and a bowl of fresh fruit; more and better restaurants to give you a relaxed choice. And more time to enjoy the facilities. In the old days, passengers hated the 6am wake up call blaring over the tannoy, with a reminder 30 minutes later to clear their cabins. On the Julia you sail an hour earlier, giving you ample time for dinner, and you disembark an hour later in morning, refreshed, relaxed and ready to go after a shower and a good breakfast. The first year of any business is brutal; all the money is flowing outwards and the work involved is enormous. Most people who have done it say ‘had they really known how hard it was going to be, they would not have done it’. And so it was for the Fastnet Line, almost buried under a ton of legal and technical work, all of which cost £1.5 million more than planned. Yet after a few weeks delay, the ferry came into service and by year end it will have carried 85,000 passengers in less than ten months. There are many reasons why you should invest in this ferry business, the most compelling of which is that it is fulfilling a needed service to a proven market. Not many businesses begin with a two year market research campaign before they start. Not many businesses take that research campaign directly to the people who used the service before and want it back. Not many businesses actually raise €3 million start up capital from those same people, many its future customers. But that is precisely what happened through ‘the bring back’ campaign. Those who demanded the return of the ferry provided the seed corn funds. Co-operatives have a history of success in Ireland and there is a wealth of experience in running them. They are set up to serve their customers and their members, in this instance to build ferry passenger, car and haulier traffic, and to promote tourism in the region. Then there are the classic reasons that accrue over time from a successful business: capital growth and dividends. Plus there are the added attraction of substantial discounts on fares for member passengers, and the promotion of businesses in the ship’s Tourist Information Office. Most of all there is the daily flow of cars and passengers, bringing business to South Wales and South West Ireland. We are seeking further investment and members to secure the future of the ferry service, the re-creation of which was hard fought and hard won. If you would like to participate contact Roy Maguire at roymaguire@fastnetline.com and he will explain the different options. To see for yourself the personal benefits of becoming a Shareholder in Fastnet Line - see here. Fastnet Line announced recently that it had exceeded its targets for the period June to August by an average of 10% in both volume and revenue terms. The Julia has now carried more than 60,000 passengers in the year to date with increased visitors noticeable on both sides of the Irish Sea. Swansea Bay Tourism recently carried out a very successful promotion in a major shopping centre in Cork City gathering lots of interest in opportunities to visit the Swansea Bay area. Fastnet Line assisted in the promotion by teaming up with Swansea Bay Tourism to provide a prize of a free return crossing in a draw for all of those who signed up for information on the stand. In addition, in the re-launch of the Southern Star newspaper which is read by more than 100,000 people across Cork and Kerry, a similar prize of a weekend in Swansea is being offered by the two bodies combining once again. Following a very successful first summer season Fastnet Line Operators Ltd. has announced they will be seeking additional funding in 2011 by way of a Business Expansion Scheme (BES) investment offering to fund the continued expansion of the business. The announcement was made at a briefing for tax advisors on board MV Julia on the 6th September. The BES is a scheme for Irish taxpayers only with relief given at the investor’s highest rate of income tax. The BES will be formally launched at the beginning of October but anyone wishing to register for a prospectus may do so by contacting Peter Roberts or Ciaran O’Shea at Roberts Nathan Corporate & Private, 4th Floor, The Atrium, Blackpool Business Park, Cork on 021 421 7940 or at info@rncap.com, and they will be happy to assist you. Plans are being made for the AGM of the Co-op which will take place in late October/early November in West Cork to be followed by an information meeting for UK shareholders who cannot attend, in Swansea shortly afterwards. The Co-op hosted the Irish Minister for Tourism, Mary Hanafin recently on a two day visit to West Cork where she visited the MV Julia at Ringaskiddy before embarking on an extensive round of meetings with tourism businesses and interest groups. The Co-op emphasised the importance of the ferry link to inbound tourism and the need to support the route over the coming years. Fastnet Line has announced new short break prices for the rest of the year and will extend these special offers into 2011. They range from one day trips without a car to either Cork or Swansea including two night’s accommodation on board starting from €59/£59 per person sharing in Nov./Dec. to €89/£79 in September. For those who wish to have a short break of three to four days with your car the offers start from €85/£73 per person sharing again including on board cabin accommodation. 7/8/10 ‘People’s Ferry’ bucks the trend! 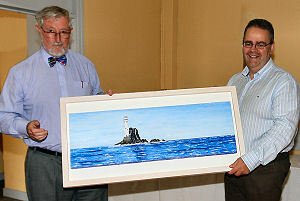 Cork artist Pat O'Dwyer presenting his painting of the Fastnet Rock to Paul O'Brien from Fastnet Line at the 3rd annual Coast Art Collective art show in Ballinspittle. 24/4/10 Time for a sea change? I WAS ONE of 10 foot passengers on Fastnet Line’s new Swansea to Cork ferry three weeks ago. And three of the other nine were my family. Then a volcano erupted – and, with it, tens of thousands of travel plans. On our return journey we were among 500 foot passengers, most in suits. The ferry staff were in shock. "IT’S mad busy," says Margaret Hegarty, spokesperson for Fastnet Line, which runs the Cork to Swansea ferry service. 30th March 2010 - We are sailing — again! “ANCHORS are well and truly away for the reinstated Swansea to Cork sailing service, as Fastnet Line’s MV Julia commandeers the waves with a cargo of locals, tourists and businesspeople who are delighted to be back on the water. Fastnet Line, the operators of the new Cork / Swansea ferry say the service will have the 'sold out' sign up for the first time this week, less than a month after first putting to sea. The 'Julia' is set to carry a full complement of passengers, cars and trucks into the South West region for the Easter break, which the company says is well ahead of their expectations for early bookings..
Chairman, Conor Buckley says there's been a great response... The 'Julia' hit the headlines for the wrong reasons, when a series of procedural and technical glitches caused cancellations and delays to some of her early sailings.. Ships Captain, Ivan Walsh, says while none of the issues were remotely serious in themselves, the hold-ups were bitterly disappointing..
As you know - Julia commenced her Swansea-Cork sailings on 10th March - which of course we are delighted with. You are also probably aware that, despite the thorough checks and maintenance that Julia went through both in Cork and Swansea - the initial sailings have suffered from some mechanical problems - which was very unfortunate. We suspended two sailings over the weekend in order to rectify these issues and we thought that you should be aware of the precise details of these problems. Paul O’Brien, Co-op General Manager travelled on the sailings from Cork to Swansea on Thursday 11th March and the return from Swansea to Cork on the 12th March. Both of these sailings were significantly delayed. On the outward sailing one of the two starboard engines developed a problem, and, while the cause at that time was unknown, the ship was stopped while a tug came out from Cork as a precautionary measure. The sailing was resumed after an hour, but the delay meant that the ferry missed the tide in Swansea and she had to wait to enter the port, so she did not reach her berth in Swansea until 12.30 p.m. on Friday. The fault was subsequently found to be an electronic problem in a governor on the engine and was rectified for the journey back to Cork. Julia was loaded without any problem on Friday night for the return journey, but when the ramp was retracted and folded there was a failure which meant that it was unable to be locked in place. Fastnet Line engineers worked to fix the problem but were unable to do so in time to catch the tide on the way out from Swansea. The problem was traced to an electronic control of the hydraulic system and was also repaired before the crossing commenced on the next available tide which was 1 a.m. Saturday (13th March). The crossing was made in good conditions on four engines and we made good time. However, during the crossing a fault developed in the pitch control on one of the two propellers. The propeller use was unaffected but the pitch control is used under different load conditions and sea states and is also used when berthing. Again this fault was traced to an electronic control which has now been repaired. The fault however was not repaired in time for the Saturday night sailing and so two further sailings on Saturday and Sunday were cancelled. Conor Buckley, Chairman and Padraig Fleming (founder member of the Co-Op), were due to travel on Saturday night and were able to assist our customers affected by the cancelled Saturday night sailing (who were offered free transport to Cork and return journeys via an alternative ferry company).The Julia has been out for sea trials on Monday 15th and Tuesday 16th March and with no further problems is sailing on schedule today Tuesday. 15th March - On a positive note.. This independent review was posted to the Irish Ferries Enthusiasts online forum -makes for encouraging reading. “I travelled out with Julia on her maiden voyage from Cork Thursday night and back on Friday night. Outside of the technical issues that led to delays (which for some of us was good news as we got to spend extra time on board which is always a pleasure on that ship) I must say that both ship and crew performed quite well, onboard facilities on Julia are absolutely fantastic and I look forward to seeing them in full operational capacity in the peak season , the crew are also very friendly and very efficient and when the service is refined a little and the bugs ironed out it will without a doubt be the best way to travel between Ireland and the UK. It is frustrating to see the company having technical difficulties that are leading to delays and cancellations so early on , but as said elsewhere its better to have them now and get them sorted out sooner rather than later. I must also give quick mention to how well Fastnet Line has been dealing with the delays and cancelations , they have done very well in providing alternative travel for those affected by cancellations , the even transferred foot passengers to their onward destinations in the UK by hired in Coach via Rosslare and those who needed to return asap also were accommodated via Rosslare so no-one was left stranded , only slightly delayed , on the crossings that were delayed there was no shortage of complimentary tea , coffee , alcohol , food , even full meals thrown in , and all passengers with pullman seats were upgraded to cabins , so in spite of the delay everyone was comfortable and the majority of people were simply enjoying what they considered to be an extended cruise <g> so in spite of it all a good time was had by all. Julia is currently berthed in Ringaskiddy, and will sail again to Swansea early next week. In the meantime engineers will be working round-the-clock to resolve the technical issues that have caused delays in her first week’s service. And some great photos of Julia loading in Swansea on 10th March for her inaugural Swansea-Cork crossing here. “The Julia has now left Swansea dock and is currently approaching the ferry terminal to board its first passengers bound for Cork at 21.50 hours tonight”. What great news for Fastnet Line, everybody who has worked so hard to get to this day, everybody who is going to travel aboard this great ship - and for business and tourist interests both sides of the Irish Sea. - 2/2/10 Ferry prepares for Irish Sea link - BBC Online News! 7/1/10 Paul O’Brien hits the airwaves! Thanks a million to Mark the video magician. (6 sailings a week in the off-peak season - 8 sailings a week in the summer).